Have you ever wondered; why are colors so important in our everyday lives? Just about everywhere you go bright brilliant colors can be seen; some jump out at you; while others blend in the back ground. They can signal danger, draw our attention and even make things appear differently than they actually are, even distort reality. Colors have a distinct effect on our mind, body and emotions. We can even associate colors with experiences or a certain brand. We are a Jacksonville Painting Company who loves to learn new ways to serve our customers better. Find out below why colors affect us in many ways. Using the right exterior paint colors or color scheme on the Jacksonville home exterior has a tremendous effect on the value and curb appeal. In addition, some colors last longer than others. ​Need help with exterior paint color ideas for Craftsman, Spanish, Ranch and Modern style homes? Contact us today! With just the right blend; the right paint colors & scheme you can change the feel, enhance many areas of your home. Did you know paint color accounts for 60 percent of our response to a space? Paint colors change our perception of a room; welcoming and soothing, inspiring or cozy. ​There are many factors; including saturation or intensity when choosing interior paint colors (see below). Applying fresh paint color transforms your home in less time and for less expense than any other home improvement upgrade. Additionally, it will protect one of your biggest investments, your Jacksonville home or business from wind, rain and the alike. ​​Yes, that's right; many studies have proven that paint color isn't just a matter of looks; far from it; it is also affects emotions and behavior. When using certain paint colors at different saturation levels to promote a certain activity in the home, color experts say to consider the main use of each room when undergoing interior painting. Certain color hues work better with encouraging an array of activities. The four main psychological colors are: red, blue, yellow, and green. Red affects the body, blue affects the mind, yellow the emotions, the ego, and self-confidence, and green the all important balance between the body, mind, and emotions. Furthermore, studies have shown, that when you combine colors, you experience the effects of both. This leaves many options with color schemes to enhance your home's paint colors. Whether a room is stimulating or soothing is not only the paint color choice, it’s the saturation or intensity of the color. For example; generally, a strong bright color is more likely to stimulate and most often a color with low saturation will soothe. 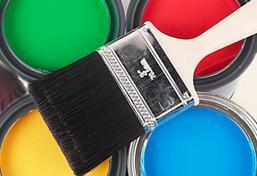 Paint color profoundly affects how productive you are. Studies have concluded that cool colors such as blue or lavenders paint colors affect your mind; pink & yellow tend to your emotions; red excites your body; and green your concentration & stability. Using these colors for interior painting can sway your mood and impact your behavior. Warm tones and earth tones like brown and beige work well to stimulate conversation. These colors can help you make better connections with other people. A living room or any room where people congregate can benefit from these paint color tones by encouraging interaction. These earthy tones are sure to add to any social area. Many have said that if you have lots of good memories in a black and white kitchen color scheme, you may want to duplicate those paint colors in your current home. Colors associated with past family bonding and fun activities can benefit your family in several ways. Just remember, stimulating colors in the kitchen can do just that; stimulate! Including stimulating you to eat too much; a ploy restaurants have used for many years with red. Be careful; stimulating colors such as red can affect you in many ways without realizing the effects, even anger. Dining rooms are best suited if your're thinking of using red hues. Cool colors can be extremely calming and are best implemented in the bedroom areas. This bedroom is a place to process your thoughts, connect, replay the events of the day and relax. Reds and Burgundy paint colors excite and can actually raise your heart rate & blood pressure; blues and greens have the opposite effect on your mood. Paint color experts agree that blue or green is the perfect color for the office. Green has long been recognized as the color of concentration and blue for productivity. In addition, bluish or greens is probably the best paint color for the work place where many of us spend long periods of time multi-tasking and problem solving. But some find it beneficial to add a bit of yellow or orange to add a hint of emotion; it helps balance out the main paint color. Make sure to contact the Painting Company in Jacksonville who understands color and it's effects. The painting company with top awards and a strong customer following!